All-American ELK ANTLER CHEWS from Montana. ELK Antlers are an annually renewable crop, providing a safe, all-natural antler chew treat for your dog. Every year, elk drop their old hard antler and start growing new antlers each and every Spring. All our antler chews are all-natural as they come from free range Elk that are never given any steroids, unnecessary antibiotics or other growth promoting chemicals. Natural Elk Antler chews are much longer lasting than rawhide or synthetic chew toys, even longer than raw bones. this is due to their high calcium content of these bone-like natural growths. 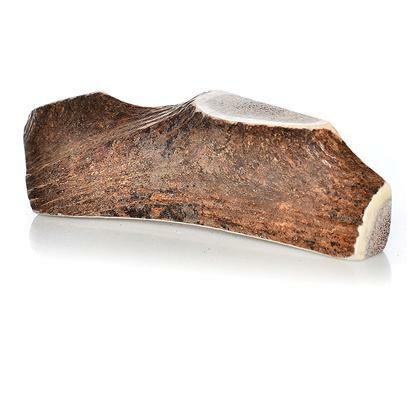 Antler Chews are stronger than raw bones and are of a finer texture. Antler Dog Chews cut from real hard antler will not easily break, chip or splinter like cooked or raw bones might. As with all treats, supervise chewing. Always take antler away from your pet if it becomes a swallow hazard.